ORATORIO (AUS) (Bay 2001-Stud 2005). 4 wins-3 at 2, MVRC CS Hayes S., Gr.3. 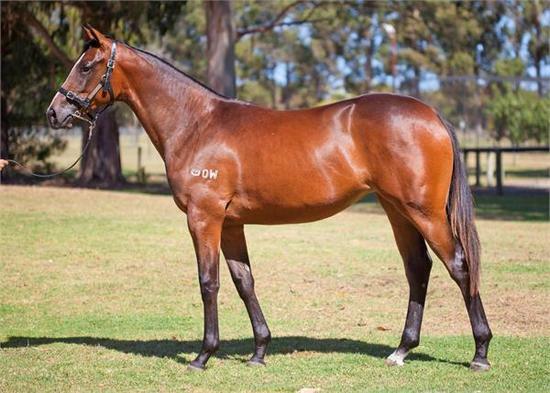 Sire of 368 rnrs, 220 wnrs, 13 SW, inc. Lucky Street (WATC Karrakatta P., Gr.2), Motion Pictures, Clueless Angel, Gold Rocks, Waratah's Secret, Gold Busker, Rafaello, Cadenza, Palace Intruder, Belora, Like an Eagle, Latoria, Trustee Brown, SP Dancing Express, Outlaw Pete, Moet Me, Shades of Rio, Passion Cantata, Indigo Ora, Cuanzo, Fire Born, Coruscation, etc. Buster's Shadow (g. by Oratorio). 2 wins-1 at 2-at 1400m, 2200m, A$95,375, to 2017-18, WATC Schweppes 2YO P., 2d WATC Multicultural Raceday 2YO P.
Weekend Shadow (g. by Bernardini). Winner at 2, A$83,290, WATC Amelia Park Wines 2YO H., 2d WATC Super Saturday at Ascot H., 3d WATC Crown Perth 2YO H., 4th WATC Aquanita S., L.
PRIDE OF RANCHO (Rancho Ruler). 4 wins-1 at 2-to 1400m, A$463,860, VRC Sires' Produce S., Gr.1, QTC Sir Byrne Hart S., Gr.2, Mornington RC RM Ansett S.H., L, MVRC Clean Up H., 2d Australian Guineas, Gr.1, MVRC AAMI Vase, Gr.3, VATC Aquanita H., Lord Dudley H., 3d WATC Beat Diabetes 2 S., Gr.1, VATC Blue Diamond Prelude, Gr.3, Gothic H., VRC Liz Davenport Welter H., 4th MVRC Bill Stutt S., Gr.2, VATC JJ Liston S., Gr.2, Caulfield Autumn Classic, Gr.2, WATC Lee Steere S., Gr.2, VATC Myer S., Gr.3, Kilmore Cup, L, VATC Eclipse S., L.
Pride of Richglen. 7 wins to 1500m, WATC Burswood Hotel Winter Series H., Burswood Apprentice Challenge, Captain Stirling H., 2d MVRC Chanak H., WATC Burswood Resort Hotel Winter Series H., Qantas Jetabout Holidays H., Mulder H., Western Pago H., Lakeside H., Heatlock H., East Fremantle H., 3d WATC Phoenix Park Welter H.
DAN BARONESS (Statue of Liberty). 2 wins-1 at 2-at 1200m, 1400m, A$185,250, MVRC Champagne S., Gr.3, MRC Danelagh 2YO P., 2d VRC Anzac Day S., L, MRC Vivarchi 2YO H., Arborea H., 4th MVRC William Crockett S., L. Producer. ARRABEEA (Zabeel). 5 wins from 1100m to 1600m, A$295,375, BTC Doomben Classic, Gr.3, VATC Thoroughbred Club S., Gr.3, AJC Toy Show H., L, STC Pacific Gaming H., 2d STC Queen of the Turf S., Gr.2, AJC James HB Carr S., L, STC Sheraco S., L. Producer. THE SOULTAKER - BULB ELITE (H.K.) (Iffraaj). 2 wins-1 at 2-at 1100m, 1400m, NZ$99,490, to 2016-17, ARC Bonecrusher S., Gr.3, Avondale JC Murdoch Newell S., L, 2d Whangarei RC Northland Breeders S., L, ARC NZ Bloodstock Insurance Pearl Series 2YO S., Love Realty Limited 2YO S.
BACCHANAL WOMAN (Encosta de Lago). 9 wins from 1100m to 1600m, A$319,190, Canberra RC National Sprint H., L, AJC Jim Beam H., Mamma Mia DVD H., 2d Canberra RC National Sprint H., L. Producer. MONARCH STAR (Kaoru Star). 3 wins-2 at 2-to 1200m, VRC Maribyrnong Trial S., L, SAJC Gatum Gatum H., VATC Chadstone H., 2d VRC Rothsay H., 3d VATC Heroic H. Sire. SILVER STARDOM (Bletchingly). Winner at 2, Gosford Slipper, L, 2d STC Leger H., 3d STC Magic Night S., Gr.2, AJC Morrie Anderson H. Producer. HAPPY REALM (Bletchley Park). 11 wins to 1400m, 534,595Rgt., S$9,191 in Malaysia, Penang TC Dr Lim Ah Soo Memorial Trophy, L, Top Kingdom H., Perak TC Regal Tan H., Selangor TC Japan Racing Association Trophy, 3d Singapore TC Lim's Classic S.
Missy Elliott (Magic of Sydney). 2 wins at 2, Hawkes Bay Forbes & Co 2YO Fillies H., 3d Matamata Breeders' S., Gr.2, ARC Great Northern Foal S., L, 4th Avondale JC 2YO Fillies S., L.